It seems that West Asia is losing a bit of its relevance as the origin of nearly every development. Much as the first steel is now known to have been made in Central Africa several centuries before the Hittites (or not: see update below), the first bronze (“tin bronze” to be specific) seems now to have been made in the Balcanic peninsula, more than a thousand years before it was in Mesopotamia. The earliest tin bronze artefacts in Eurasia are generally believed to have appeared in the Near East in the early third millennium BC. Here we present tin bronze artefacts that occur far from the Near East, and in a significantly earlier period. Excavations at Plocnik, a Vinca culture site in Serbia, recovered a piece of tin bronze foil from an occupation layer dated to the mid fifth millennium BC. 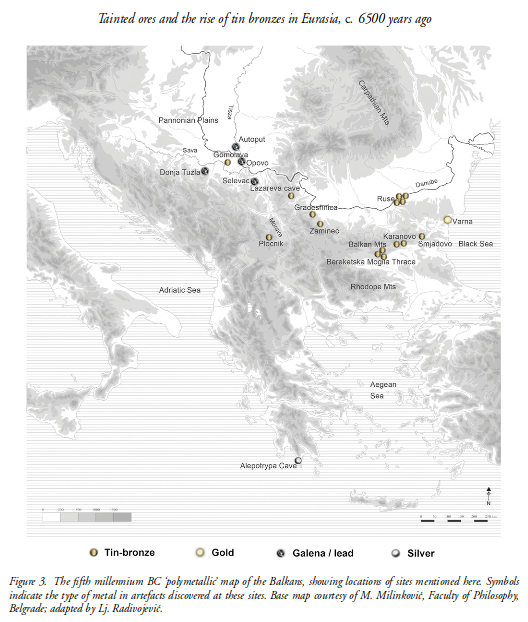 The discovery prompted a reassessment of 14 insufficiently contextualised early tin bronze artefacts from the Balkans. They too were found to derive from the smelting of copper-tin ores. These tin bronzes extend the record of bronze making by c. 1500 years, and challenge the conventional narrative of Eurasian metallurgical development. The specific well-dated finding is from Plocnik, Southern Serbia, however as we can see in the map below, most 5th millenium bronze sites are from Bulgaria. This highlights the likely central role in this earliest bronze metallurgy of the Karanovo-Gumelnita culture (very likely a full-fledged state older than dynastic Egypt), which spanned most of Bulgaria, as well as some nearby regions by the south and the north. However the neighbor cultures of Gradesnica-Krivodol (NW Bulgaria and nearby Romanian areas) and Vinca (Serbia) were also involved. The highest quality alloys (stannite bronzes) belong to this core area of Thrace (Karanovo, Smjadovo and Bereketska Mogila), as well as Southern Serbian sites (Plocnic and Lazareva) while a second category, “high tin fahlore”, seems to concentrate along the Danube (Gomolava and Ruse). A “low tin fahlore” category is rarer and seems centered in the Gradesnica area. For some reason, maybe the disruptive Indoeuropean invasions of the 4th millennium, this technology was apparently lost later on, only to be regained from a West Asian source (Troy) already in the 3rd millennium. Stannite is present in the Bronze Age mines of Mushiston in Tajikistan (Weisgerber & Cierny 2002), Deh Hosein in Iran (Nezafati et al. 2006), the Bolkardăg mining district in Turkey (Yener & ̈Ozbal 1987), as well as in Iberia (Rovira & Montero 2003). The West and Central Asian mines are often argued not to have been sizable enough to be a major source of tin in the Bronze Age proper but, considering that this is a very early and limited bout of advanced metallurgy, I guess that they are also possible sources. Update (Jan 22): I must (partly) take back my initial comment on steel metallurgy being older in Niger than Turkey: while the discovery of Nigerien steel-making c. 1500 BCE stands, other recent findings in Turkey seem to push back steel metallurgy in Anatolia to c. 1800 BCE (instead of the c. 1300 BCE date accepted before). Thanks to Aeolius for making us aware of this important detail. Note: thanks to the Stone Pages newsletter ArcheoNews for directing me to this most interesting study. To better define the structure and origin of the Bulgarian paternal gene pool, we have examined the Y-chromosome variation in 808 Bulgarian males. The analysis was performed by high-resolution genotyping of biallelic markers and by analyzing the STR variation within the most informative haplogroups. We found that the Y-chromosome gene pool in modern Bulgarians is primarily represented by Western Eurasian haplogroups with ~ 40% belonging to haplogroups E-V13 and I-M423, and 20% to R-M17. Haplogroups common in the Middle East (J and G) and in South Western Asia (R-L23*) occur at frequencies of 19% and 5%, respectively. Haplogroups C, N and Q, distinctive for Altaic and Central Asian Turkic-speaking populations, occur at the negligible frequency of only 1.5%. Principal Component analyses group Bulgarians with European populations, apart from Central Asian Turkic-speaking groups and South Western Asia populations. Within the country, the genetic variation is structured in Western, Central and Eastern Bulgaria indicating that the Balkan Mountains have been permeable to human movements. The lineage analysis provided the following interesting results: (i) R-L23* is present in Eastern Bulgaria since the post glacial period; (ii) haplogroup E-V13 has a Mesolithic age in Bulgaria from where it expanded after the arrival of farming; (iii) haplogroup J-M241 probably reflects the Neolithic westward expansion of farmers from the earliest sites along the Black Sea. On the whole, in light of the most recent historical studies, which indicate a substantial proto-Bulgarian input to the contemporary Bulgarian people, our data suggest that a common paternal ancestry between the proto-Bulgarians and the Altaic and Central Asian Turkic-speaking populations either did not exist or was negligible. I find notable that the most common haplogroup seems to be I (27.6%) in all main variants: I1 (4.3%), I2a1b (20.2%) and I2a2a (1.7%), plus 0.4% I*. The only important missing clade is Western Mediterranean I2a1a. It reinforces my notion of I originating in SE Europe, Eastern Balcans or Ukraine maybe. Feel free to correct me if you think you know better anyhow. structure (although it is ultimately African, of course). This paper claims an Epipaleolithic origin for this Balcanic cluster, although experiencing Neolithic expansion. Not really surprised about this, I must say. 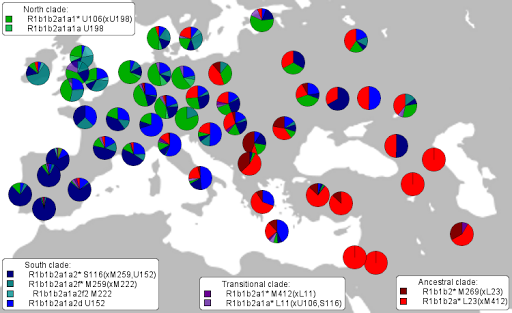 The third most notable haplogroup is R1a1a (17.5%), an Eastern European and Northern South Asian lineage with some spread in Central Asia as well. The authors remain cautious on this lineage’s origins and dates of spread in wait of further phylogenetic resolution. Haplogroup J2 (10.7%) is also important, while the presence of J1 is minor (3.4%), both in reasonable accordance with what is found in nearby populations. The authors attribute a Neolithic origin to the expansion of subclade J2b2 (M241) in the Balcans. Less important are G (4.8%) and T (1.6%). Minimal presence exists of E(xE1b1b1) (0.4%), Q (0.4%) and C (0.5%). This last seems to reject any significant retaining of the presumable Turkic ancestry of the Bulgarian ethnicity (the original Bulgars were Turkic speakers, somehow related to the Huns). 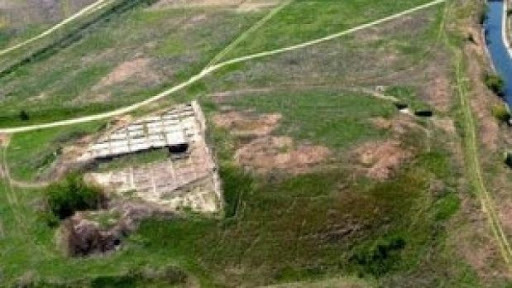 Tell Yunatsite in Southern Bulgaria was an important settlement of the Chalcolithic, in the context of an advanced culture that was older than Egypt or Troy. The place was settled in the seventh millennium (Neolithic) and destroyed by invaders at the end of the fifth millennium (Chalcolithic, Indoeuropean invasions), briefly resettled only to be evicted once again and left empty for a whole millennium. Later it was reoccupied in the late Bronze Age (Thracians) and continuously inhabited until the Middle Ages (when it may have been evacuated in the context of Slavic invasions). generally Neolithisation spread to Europe from Anatolia and the Near East. App. under the pressure of both drastic climatic changes and invasion of Early Indo-Europeans. about the “lost” first civilization in Europe. They are looking for volunteers with an interest in archaeology and decent health for the campaign of summer 2013. Participation provides credits for university students. More information on the relevant Prehistory and the volunteer program at Balcan Heritage. According to the Sophia Globe (h/t Pileta), the oldest ever city in Europe would have been located at Provadia (Varna province, Bulgaria). The city is defined as such by medieval standards because it is a settlement surrounded by a wall, a very thick and solid one. However only a few hundred people (300-350) lived inside them, always according to Prof. Vassil Nikolov. Nikolov attributes the city an age of 4700-4200 BCE, belonging to the context of Varna culture and related to the relatively well known Varna necropolis, probably the first princely burial of the continent. However such an early age places the Provadia-Solnitsata city almost two millennia before any other known European city (Greek islands, Southern Iberia) and even 1500 years before Troy I, traditionally considered a major influence in the urbanization and Bronze Age of Europe. Not even Egypt’s civilization is nearly as old; in all the wider region only some fortified cities from the Levant and Mesopotamia are as old and, excluding Jericho (c. 6800 BCE), none is significantly older. Even the oldest known Sumerian city, Eridu, was built only a few centuries before this Bulgarian city. Looking for more information on the matter I also stumbled upon this webpage by Dr. L. Nikolova, which discusses the Provadia settlement as a salt-exporting site, something that also seems to be the leit motif of Nikolov’s abstract. I am not really surprised by these findings because it has been known for some time that the area of Bulgaria was a very old center of civilization, comparable in age to Egypt (or, as it seems to be the case now, even quite older), probably evolving state and aristocracy structures first of all in Europe. It was probably the wealth of this realm and its successors which baited the Indoeuropean nomads into invasion later on (economic relations with the Volga are attested as early as this time). The only thing that really puzzles me is the age because when I first learned on these matters the time-frame appeared to be a thousand years more recent, more in agreement with other urbanizing and social-complexity developments elsewhere in Europe (Aegean, Iberia), Western Anatolia (Troy) and also Africa (Egypt). But well… I have to accept the dates estimated by the researchers, I just wish I knew a bit more about how these have been produced. I must say that unlike the Varna necropolis burial which I initially used to illustrate the news, the burials shown here appear to be of the classical Neolithic flexed style (the lower part may be missing but the size of the pit and lateral deposition strongly suggest that. I’m not just inferring from that and another photo but it was actually the burial style of all Balcano-Danubian Neolithic peoples and even some “Danubianized” Indoeuropeans later on: flexed lateral burial, so it is what should be expected in this context. The extended position is actually typical of Paleolithic Continuity peoples, and the use of ochre is specially documented in Eastern Europe: Dniepr-Don Neolithic and related groups like Pitted Ware and the Early Bronze culture of Ezero also in Bulgaria but thousands of years after these layers. At the Varna museum site however they do explain that the burials in what was surely a royal or otherwise princely necropolis are of two kinds: (a) 99 burials (mostly men) are in extended position (Paleolithic tradition), while other 67 (many of them women) lay on their right side in flexed position (Neolithic tradition). This could point (my best guess here) to early penetrations from the steppe (Dniepr-Don culture), comparable maybe to those we see around the Baltic (Pitted Ware), all however anticipating and maybe preparing the way for what is probably the true Indoeuropean penetration of the Kurgan wave of cultures, which in most cases would return to the flexed burials… now in kurgan (tumulus). However in Bulgaria the period of Kurgan invasions culminates in the formation of Ezero culture, which is the only one retaining extended burial with ochre, by that time already vanishing in the steppe and the Baltic.